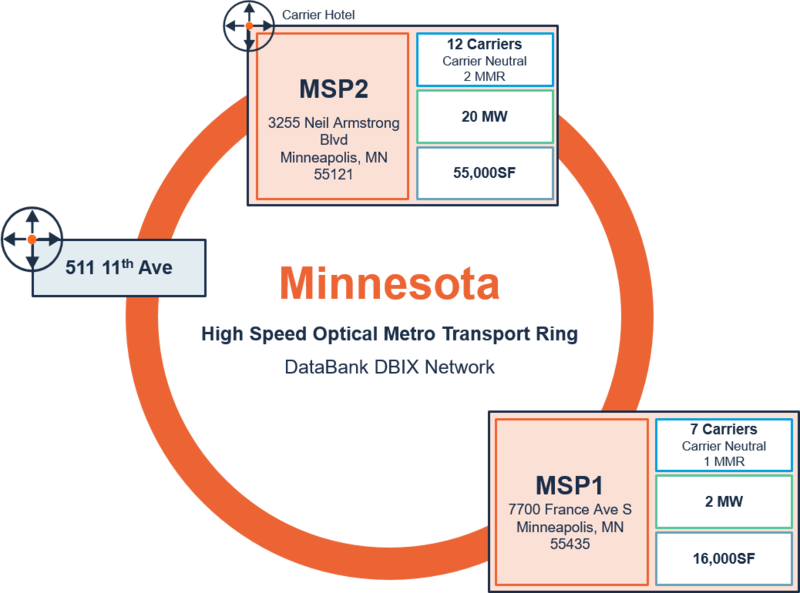 Databank has two strategically located data centers in Minneapolis – MSP1 West Twin Cities and MSP2 East Twin Cities. There are an abundance of Fortune 500 Companies in the region including United Health Group, Target Corporation, Best Buy, Supervalu, and 3M. The high standard of living in the area helps fuels entrepreneurial growth and opportunity. Minnesota offers a sales tax rebate for all hardware and software deployed at the MSP2 site. The cold weather climate allows for utilization of high efficiency air-side or water-side economizers, allowing for free cooling 9 months out of the year. Minneapolis/St. Paul is the 15th-largest metropolitan area in the United States with low power costs, and a reduced instance of geological and meteorological negative events. Located in the Technology Business District within Edina, MN, DataBank’s West Twin Cities data center includes more than 16,000SF of space for customer equipment. Diverse power feeds, dedicated diesel-powered backup generators, and a redundant cooling system ensure continuous operation. Our East Twin Cities data center is located in Eagan, MN, to leverage the city’s dense concentration of high performance fiber. As a purpose-built multi-tenant data center, the 90,000SF structure provides 20MW of power capacity, and access to a multitude of telecommunication providers within dual, carrier-class Meet-Me-Rooms. DataBank builds it’s own private fiber ring in metros with multiple facilities. We also connect to other carrier hotels within the metro. Our National IP Transport Service provides inter-region and intra-metro region connectivity. This service provides a resilient communication method for connecting environments within multiple DataBank sites.